Bedale is a great base to explore the surrounding area, with a wealth of gorgeous villages you’re guaranteed to discover some hidden gems. Crakehall is just 2 miles north east of Bedale, The five-acre village green with its giant sycamores and lime trees is dominated by Crakehall Hall and is enclosed by stone built cottages dating back to the 1750’s. A couple of miles south of Bedale is the beautifull village of Snape. The village has many historic connections including to the mother and wife of Richard III. Snape Castle was the residence of Catherine Parr and her husband, John Neville, 3rd Baron Latimer, before she became the sixth wife of King Henry VIII, and involvement in the Pilgrimage of Grace in 1536. 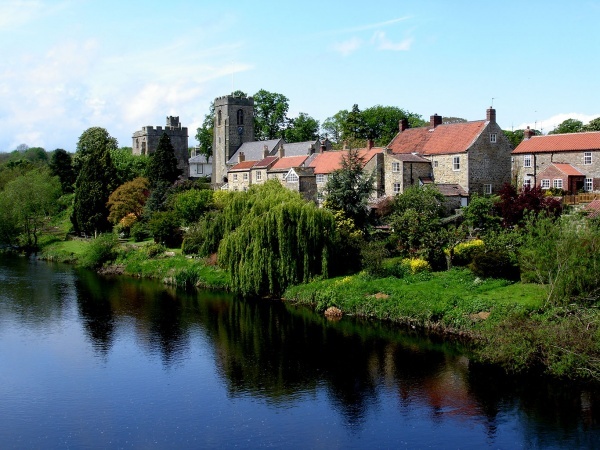 Other local villages worth exploring include, West Tanfield set along side the River Ure. The village has a monument called the Marmion Tower, a 15th century gatehouse which belonged to the now vanished manor house and former home of the Marmion family. At first floor level there is an example of an oriel window. The tower is now in the care of English Heritage and is a Grade I Listed building. Northallerton is the county town of North Yorkshire and only 7 miles from Bedale. It has a thriving market on Wednesdays and Saturdays and a Betty’s tea room! Thirsk is 10 miles away, famous for the World of James Herriot, it also has a racecourse. Driving west takes you to Leyburn (home of Tennants Auctioneers) and a stunning drive through Wensleydale to Hawes.